Seeing the historic pay-per-view projections come flooding in for UFC 229 is incredible and a testament to the star power of Conor McGregor. After nearly two years away from the UFC, the Irish superstar returned to action in a contentious battle against an undefeated juggernaut and well over two million people dug into their pockets in order to see what transpired. What they saw was exactly what Khabib Nurmagomedov forecasted – a one-sided mauling where he made McGregor pay for every incendiary word he offered in the build-up to the contest before forcing “The Notorious” one to submit. And then they got a little more, as Nurmagomedov scaled the fence and instigated a fracas between the two teams that has his future in the UFC shrouded in mystery. Should he remain on the roster, the massive numbers generated by UFC 229 and the aftermath of the fight make it likely that an immediate rematch between Nurmagomedov and McGregor will be booked, not because their prior encounter was wildly competitive and left questions unanswered, but rather simply because if the first fight did roughly 2.5 million buys, imagine how big the sequel will be now that there is footage of the post-fight melee to include in the promotional trailer? They’re absolutely right and they’re statements are as applicable to MMA fandom and media coverage as they are to the goings on around The Association. From a competitive standpoint, there is no reason for Nurmagomedov to ever share the cage with McGregor again — he beat him convincingly and there is no amount of time that McGregor could spend focused exclusively on grappling that will close the gap between he and the undisputed lightweight champion when the fight hits the ground. 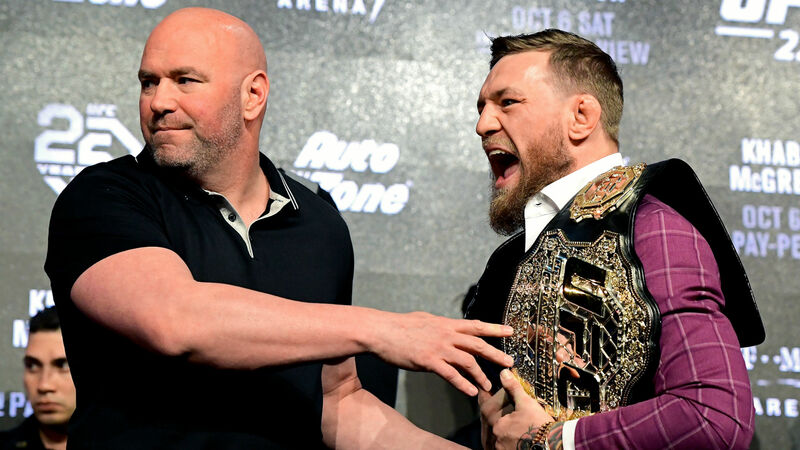 But nothing will attract more interest from casual fans and offer as much pre-fight hype as a rematch between the two, as McGregor remains the most recognizable figure in the UFC by a country mile and the UFC 229 melee adds to the legitimate bad blood narrative used to sell the first encountered between the two. It doesn’t matter that there are more intriguing matchups out there for Nurmagomedov and other lightweights with a far greater case for a title shot. What matters is that the preamble to a second bout between the two would generate far more interest and much more mainstream attention than any of those other potential pairings, which is why it is increasingly likely that a rematch will occur in the not too distant future. This isn’t just a micro issue that pertains only to Nurmagomedov and McGregor either. Zooming out, the idea that the gossip and drama surrounding the sport is of greater interest to a larger portion of the audience is even more apparent. While the existing tension and previous chaotic exchanges involving McGregor and Nurmagomedov undoubtedly contributed to the staggering pay-per-view buy rate, stripping the drama away still left you with a matchup between a former two-weight world champion who is the one of the biggest sports stars in the world and an undefeated wrecking machine who has talked about as a world-beater for the last several years. Where it really becomes apparent is in the terrific contests, quality cards and compelling stories that are undersold, undervalued and left untold far too frequently. Every week, more fans and media talk about who said what about whom on Instagram and Twitter than many of the fights scheduled to take place that upcoming weekend. They dissect tweets and fixate on the every word of the biggest names associated with the sport, even when they’re irrelevant or flagrantly ironic, in order to include that person’s name in a headline. Over the hill veterans get far more oxygen than lesser-known emerging talents, even though the former are well past their primes and no longer competing at a high level and the latter group represents the future of the sport. We hear all about who has beef with whom and whatever name-calling is taking place on social media, but very little about the surging upstart who has steadily gotten better over his last eight fights or the promotional newcomer with the heart-wrenching backstory. When there are few stars and no major drama on a card, it is dismissed as being average at best, even though every event is full of compelling stories and competitors worth tracking and it contributes to the increasing problem of people who follow the sport being unaware of talented fighters who have been enjoying success right under their noses. Social media impressions and traffic numbers rule the day and events are judged not on the quality of the matchups that make up the card, but by how many pay-per-view buys it will generate or the numbers of recognizable names competing on the main card. However none of those metrics or variables speak to the quality of the story, the depth of reporting or the overall importance of the matchups going forward — they’re largely popularity markers and these days, short-burst stories about random drama or gossip does infinitely better than meticulously researched long-form stories and in-depth features on fighters with a compelling story to tell. That’s what people want more than anything, including the fights themselves. Take the upcoming featherweight title clash between Max Holloway and Brian Ortega for example. The UFC 231 main event is one of the absolute best fights the UFC could make at this moment and it will be lucking to do 20 percent of the pay-per-view buys that Nurmagomedov and McGregor did earlier this month because there is no tension between the two. They’re simply elite talents at the peak of their powers, eager to test their skills against one another with the featherweight strap hanging in the balance. Even though the rest of the main card includes another outstanding championship clash and a few compelling contests, UFC 231 is more likely to do 10 percent of the estimated 2.4 million pay-per-view buys UFC 229 pulled in than it is to eclipse 500,000 buys simply because Holloway and Ortega aren’t huge stars (though they absolutely should be) and there is no real drama attached to the show. It’s just a bunch of really great fights, but who cares about those anymore? Who will replace AC Milan in Europa League and why have the former European champions been banned for one year?